Totalitarian regimes require the complete subservience of the individual to the state and tolerate only one party to which all institutions are subordinated. Iran is an un-free society with a keen, intermittently brutal apparatus of repression, but it’s far from meeting these criteria. Significant margins of liberty, even democracy, exist. Anything but mad, the mullahs have proved malleable. Most of Iran’s population is under 30; it’s an Internet-connected generation. Access to satellite television is widespread. The BBC’s new Farsi service is all the rage. Abdullah Momeni, a student opponent of the regime, told me, “The Internet is very important to us; in fact, it is of infinite importance.” Iranians are not cut off, like Cubans or North Koreans. This is great. And science (and not just nuclear and rocket) is also progressing as well. For example see an earlier post on Iran's stem cells research. The meddling from religious authorities is still a problem - but one can see the vibrancy of the society. 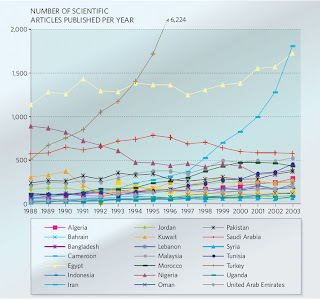 Check out the figure below from Nature (2006) that shows a strong increasing trend of scientific articles form Iran from 1998 to 2003 (the other rising country is Turkey in the figure). This is all the more dramatic when compared to the dismal stagnation rate of under 500 scientific articles per year for most of the other Muslim countries (Turkey and Egypt being the strong exceptions). Any ways, good to see this article about Iran in the NYT. Read the full Roger Cohen article here. As a bonus, check out this Fresh Air interview with actor and stand-up comedian Maz Jobrani. 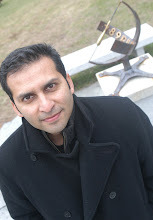 He is very funny and he takes full advantage of his Persian heritage. Thanks for an excellent blogg!